Meet one of the Co-Founders of Dasher, Wei Kheng. He’s been selling online since 2011, and never thought that he can make it this far after 7 years. Dasher is an ecommerce retail company established since December 2011 in Malaysia. They are famous for providing electronic appliances and IT gadgets with reasonable price and assured quality. Wei Kheng and his partners, Wei Bin and Zack are already performing sellers in marketplaces at a young age of around 24 years old. In fact, Dasher has been featured as one of the top sellers in 11street and Lelong. You can find Dasher both online and offline. 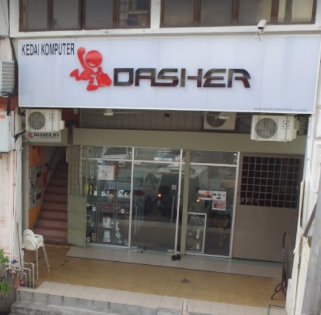 Dasher online store is available across most Malaysia marketplaces, such as Lazada, Shopee, 11street and Lelong, filled with satisfied buyers and great reviews. Or if you prefer, feel free to locate their physical store in Cheras. Ps: Just in case you are reading this and would like some recommendations for IT gadgets, feel free check out Dasher’s online store! They’ve started using SiteGiant since 2016, and despite their age, they’ve made it this far in their ecommerce journey. And so, what’s the secret behind all their profound success? Understand the urgency of starting ecommerce as soon as possible. Started venturing into ecommerce since they were 17! Wei Kheng and Wei Bin actually started selling online while they’re still in high school. While Zack joined in later during 2012. They started off by getting some power banks from suppliers and sold it online. I still remember back in those days, power banks’ plugs have 8 kinds, Samsung, LG, Nokia etc. We realized that it was in high demand and we took action upon the trend. Later on, he and his partners bring this up a notch – selling power banks in Lowyat forum. They got a lot of sales from Lowyat forum despite still being high school students. This is when they realized that ecommerce is their next big thing. The trio ventured into Lelong during 2013, while they were still in diploma. Of course, being young entrepreneurs, they had their ups and downs. Like any other new ecommerce merchants, they didn’t get many sales from Lelong when they first started. However, after improving their content marketing strategies, they began to get sales. Their sales in Lelong was doing pretty well back then. They ended up renting a 500 square feet office in Bukit Mertajam during 2013 because their sales in Lelong gotten really good, and their parents were complaining about them causing a mess in their houses due to the boxes and goods lying around. But that’s not enough for them. They wanted more. Then, 11street came to Malaysia in 2015, and that’s when their ecommerce journey officially took off. I still remember seeing a success story about this person selling Gundam on 11street and got tons of sales within a day. I was overseas back then, sourcing products. That night, I put in some thought and decided to place some advertisements on 11street. When I woke up the next day, I was so surprised that the sales just came rolling in. Sales figure went out of control that day, and we were short staffed. It was incredible. What sets them different from any IT gadget store is that they pour their heart and soul into everything they did. We will always try to come out with different content when it comes to our products because there’s a lot of competition in the market. And that is what sets us different from them. They moved their headquarters from Penang to KL around 2014, when they realized there’s an emerging opportunity in the ecommerce business. There’re a lot of products that were not available in Malaysia back then, and most providers took around 10-15 days just to get the products to their customers. They devise a plan, where they found a way to shorten the shipping period to 2-3 days, so customers can get their hands on the products within 3-5 days. This actually spikes up their sales and increase their brand awareness. Me and my partners, we always try to venture into new unknowns. I think that is what makes us different – the courage to do things differently, and never stop thinking of ways to improve and enhance when it comes to customer service and internal workflow. Now with their own business and a team of 13, they’re able to manage all their online business through SiteGiant. With SiteGiant Marketplace sync, their employees can list and manage inventory from all participating marketplaces with just a few clicks. Meanwhile, the three of them have more time to explore new opportunities. We use SiteGiant Marketplace Sync to sync with 11street at first, then slowly Lazada, Lelong and Shopee. It’s really useful for us and our staff don’t need to upload products to all the marketplaces one by one. These young entrepreneurs are always trying new things and venturing into new opportunities, and that’s why they are successful in the ecommerce industry. SiteGiant is grateful for being a part of their journey, helps them to save time when it comes to workflow, increase productivity and publicity.